Location. Easy walk to the bridge and opera house. Nice apartment, 15 min walk to Sydney attractions. Excellent staff , so nice and helpfull. Location was good, about 40 minute walk to Opera House and Circular Quay, very quiet, security was good. Hours at the front desk were fair. On our last day, our flight left after 9pm but had to be back at the property before 5:30 to get our luggage which they were nice enough to hold. Room was cleaned once while we were there 4 nights but they didn't vacuum the room. Quite, convenient & comfortable. The staff are very friendly with good sense of humor. Especially like the Kitchenware, washing machine. They are very good quality & easy to use. Like living in my own house. Nice stay. Thanks! Its quiet and allows a restful night! Its big and perfect for a family of 4. You can get breakfast for an extra 10 dollars. It’s a quiet area but near the waterfront. Great for walks or a run. Coles express is right across the street. The beds are comfortable. They provide kitchen things but require you to clean up when you’re done or they’ll charge a cleaning fee. Otherwise it’s a cosy place to call home for a long holiday. They also provide washing machine and dryer for those who want to travel light. 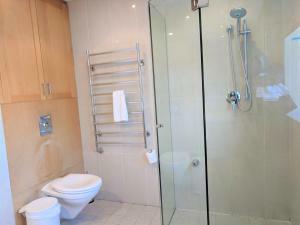 Nice 2 br apartment near the wharf and walking distance to all major sites. The staff were very helpful and let us checkin early after arriving from the airport. We loved the staff, they were excellent. The location was fabulous. Beds were comfy. Close to everything. Nice view, could look out into the harbour or in towards the city. 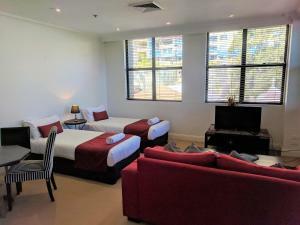 Lock in a great price for Waldorf Woolloomooloo Waters Serviced Apartments – rated 8.8 by recent guests! 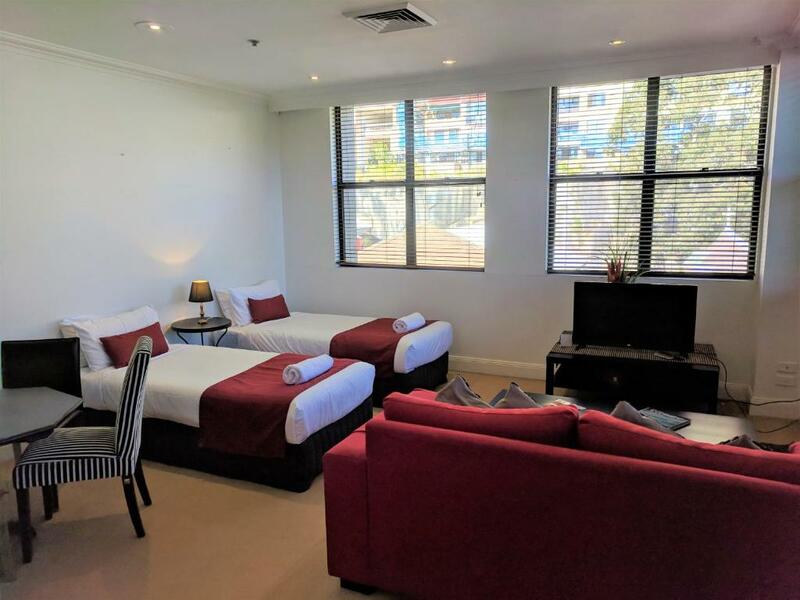 Waldorf Woolloomooloo Waters Serviced Apartments This rating is a reflection of how the property compares to the industry standard when it comes to price, facilities and services available. It's based on a self-evaluation by the property. Use this rating to help choose your stay! 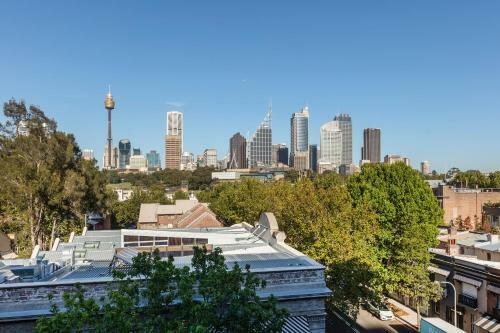 One of our top picks in Sydney.Located on the city center's edge, Woolloomooloo Waters Apartment Hotel offers spacious studio apartments in a beautiful heritage listed 4 story building, located among traditional Sydney terrace houses in historic Woolloomooloo. 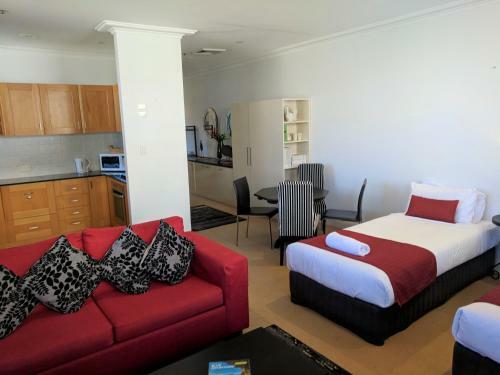 Each air-conditioned apartment at Woolloomooloo Waters Apartments includes high ceilings, bathrooms, kitchenette and a living/dining area with cable TV. Some apartments also have a private balcony and laundry facilities. Guests enjoy 1GB of free WiFi per day. There is a coin-operated guest laundry and bed linen is provided in all rooms. A fitness center and children’s playground, tennis & basketball courts are located opposite the Apartments. A light continental breakfast is available at an additional cost. 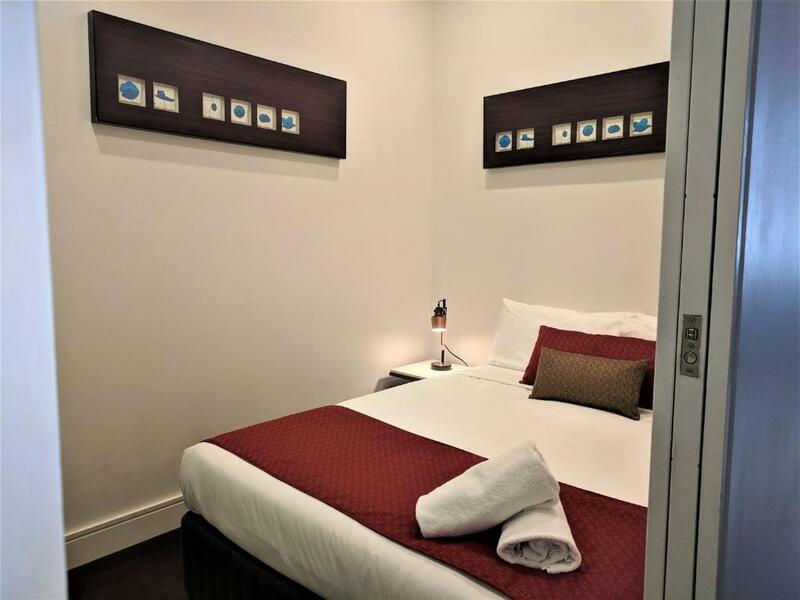 Woolloomooloo Waters Apartment Hotel is a 3-minute walk from the restaurants, bars and shops at the historic Finger Wharf. It is a 20-minute walk through the Botanic Gardens via the Art Gallery of NSW to Sydney Opera House and Circular Quay. 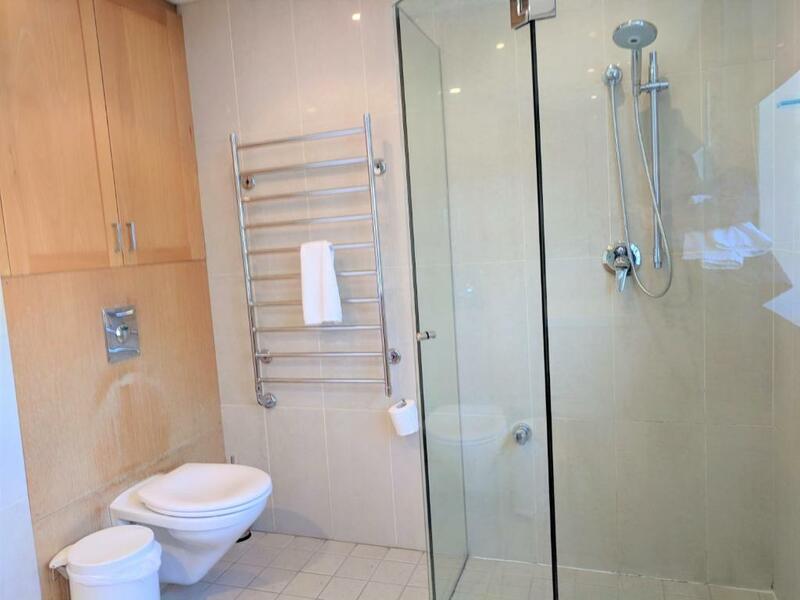 The property is a 15 minute walk to Sydney Tower, Hyde Park and the Central Business district. 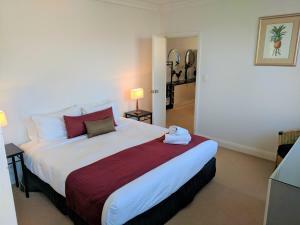 When would you like to stay at Waldorf Woolloomooloo Waters Serviced Apartments? The spacious open plan studio apartments all vary in design, layout & bedding configuration, all contain kitchenette, refrigerator, microwave, sofa & dining facilities. When booking a studio apartment, you may request your preferred bedding configuration in the special requests box at the time of booking. Please note the bedding configuration is not guaranteed and will be confirmed upon arrival, subject to availability. The bedding configuration options are, 2 queen-size beds or 1 king & 2 singles or 1 king & 1 single or 1 king & 1 sofa bed. Your apartment will receive a light service every second day of your stay if your stay is of 4 nights or more. 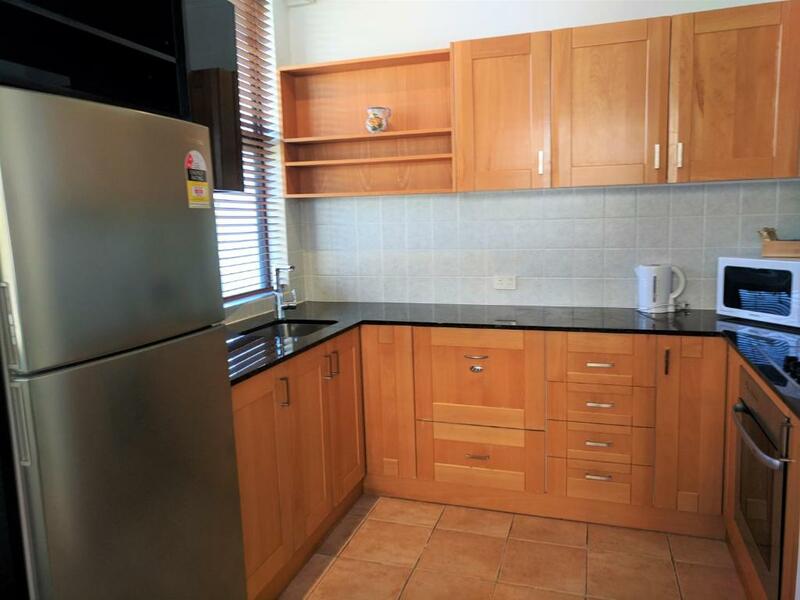 This spacious, older style 2 bedroom, 2 bathroom apartment has a large balcony with spectacular city and harbor views, kitchen with oven, microwave & dishwasher, large dining facilities, sofas & laundry facilities. The first bedroom contains 1 king-size bed, the second bedroom contains 2 single beds and a sofa bed is located in the living room. A maximum of 6 people using existing bedding is suitable for this apartment. Your apartment will receive a light service every second day of your stay if your stay is of 4 nights or more. Waldorf Woolloomooloo Waters Serviced Apartments offer comfortable, well-appointed studio, one, two and three bedroom apartments. The apartment complex is located on the edge of the city. The spacious size of our hotel apartments, which are almost double the size of a standard hotel room, makes them ideal for small business travel and meetings as well as family Sydney accommodation. 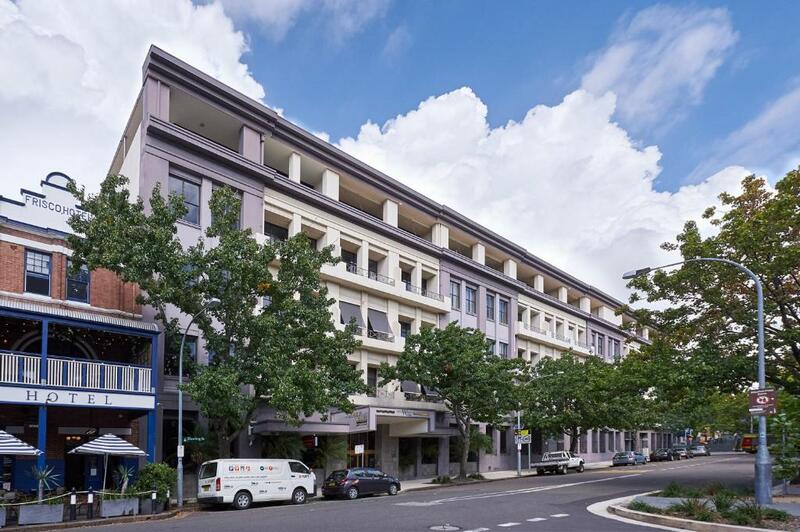 Waldorf Woolloomooloo Waters Serviced Apartments are superbly located for both business or leisure as it is a short distance from Sydney CBD's major shopping precinct, government offices, business and financial district. Area Info – This neighborhood is a great choice for travelers interested in botanical gardens, walking and city walks – Check location Excellent location – show map Guests loved walking around the neighborhood! House Rules Waldorf Woolloomooloo Waters Serviced Apartments takes special requests – add in the next step! Waldorf Woolloomooloo Waters Serviced Apartments accepts these cards and reserves the right to temporarily hold an amount prior to arrival. The studio apartments all vary in design, layout and bedding configuration. When booking a Studio apartment you can request your preferred bedding configuration in the Special Requests Box at the time of booking. Please note that the bedding configuration is not guaranteed and will be confirmed upon arrival, subject to availability. Reception closes at 18.30 Monday to Friday and 17.30 Saturday and Sunday, guests arriving after this time must contact the property in advance to obtain after hours check-in instructions. Please use the contact details found on the booking confirmation. Please note on-site secure parking is available for 1 car at an additional cost of AUD 35 per night. Please note that a 1.4% surcharge applies for payments made with credit card. Please note that free WiFi is limited to 1GB per day. Additional WiFi can be purchased for a charge. Guests are required to show a photo identification and the credit card provided for payment of reservation upon check-in. Please inform Waldorf Woolloomooloo Waters Serviced Apartments of your expected arrival time in advance. You can use the Special Requests box when booking, or contact the property directly using the contact details in your confirmation. A bit of maintenance wouldn't go astray. Power points that didn't work and a missing toilet flush button. It is a relatively quiet street but you can hear every doorstep and conversation outside from 3 story's up. Needs a bit of double glazing. Pub next door was rowdy and lots of shouting one night. No dishwasher but no big deal. EXCELLANT staff. Loved our room! Plenty of storage and space. Could have had more cooking items like lg/ med serving bowls, cutting board and a strainer. You need to buy cooking oil, spices etc. The room was clean and well set out, the bed very comfortable. I prefer being able to open the windows. This particular unit had double glazing making it difficult to do so. Also, being on the 1st floor and quite low to the ground, security would have been an issue if I had opened them. The location is pretty fantastic. It's such a pretty part of town. The apartment was large and well appointed. I managed to secure a good price for my three-day stay making it exceptionally good value. Our last night was kept awake by a party on the street below us. To be clear, it was not in the hotel.